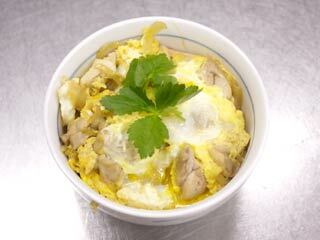 "Oyakodon. "Unlike Katsudon, this time we use chicken and egg. Oyakodon literary means "parents and child" bowl. Chicken for parent, egg for child. It is one of the popular Japanese family dishes. First add little Dashi into water, then start boiling. Then, add sugar for one small table spoon. You can adjust the taste later. Add two large table spoon of soy sauce. Add one large table spoon of Mirin. That's it for base soup. Make sure you check the taste and adjust flavors. Peel off onion, and slice about 5mm wide. Next Chicken. Cut it about one bite size. First add base soup to pan. After onion get softer, add chicken. Make sure you have to cook chicken well. After chicken is cooked, add egg. Remove the white piece, and mix them roughly. Pour from the center to out. Then put cover over it. When egg is cooked, that's it. Put it on a bowl, and add clover.